Tonight we drank little shots of spicy ganache to finish up the ganache from the dipped stawberries (two days ago). We added a heafty amount of cayenne and a touch of milk to the chilled ganache, then melted it all together and topped it with fresh, real whipped cream. They were a decadent and delightful “leftovers” treat. 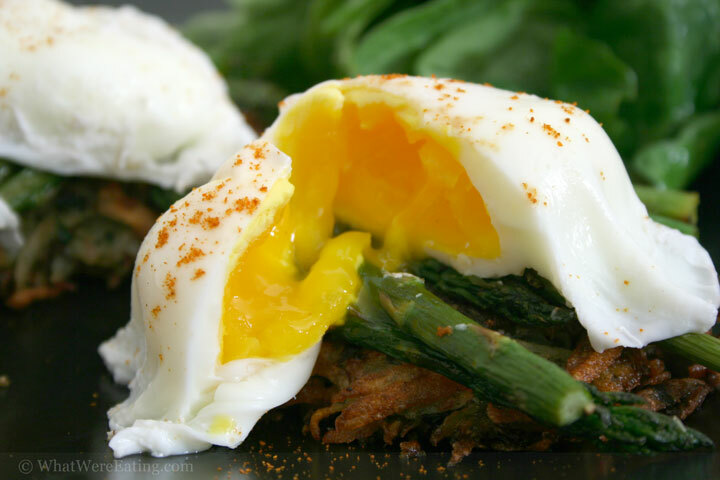 Poached Egg over Asparagus and LatkeA: it seems like all we’ve been eating lately is sweets! at least judging by our main pictures. T: this is true. It’s much harder to get all the pieces to fall together for a meal photo than for a simple dessert photo. T: jeez, you didn’t have anything anywhere close to a culinary failure. 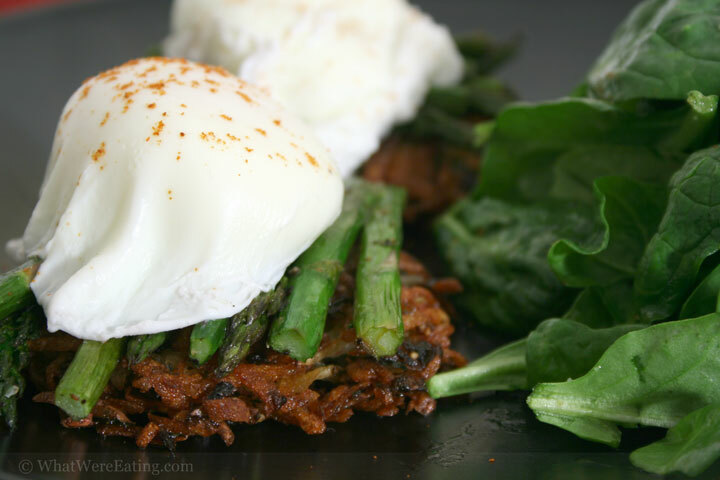 The eggs/asparagus/latke was awesome! A: thanks t! i thought the latke was particularly good. here are my culinary failures 1) i plated the dark meal on a dark plate, a big no no 2) i over cooked the eggs 3) i broke the first thyme hollandaise and 4) i broke the second thyme hollandaise, thus there is no sign of hollandaise in the picture. It was really weird though, because after the photo shoot, the hollandaise had miraculously re-emulsified. just wierd. T: well, you are too hard on yourself, although that’s part of what makes you such a damn good cook. Lesson learned on the black plate thing. I hadn’t thought of that before tonight- now we know. It’s too bad we don’t have a photo of the hollandaise, but damn it was tasty. A: it was quite good. i had no idea that if the hollandaise was left alone for like.. ten minutes it would reform the bonds. i really was in awe of the whole thing. i do think it was a tasty meal. i was just MEGA frustrated by the time we sat down to eat it. T: So, can you explain a little more of what it means to “break” the hollandaise? A: to break the hollandaise means to mess up in a way that the oil (aka butter) is not bonding to the slightly cooked, whipped egg. the sauce is no longer emulsified. it is supposed to be creamy and smooth. when you break it is gets kind of lumpy/grainy and you can see the oil separate. T: ahh, ok. cool. Well, not cool. Well, anyway, dinner was really more exciting than the dessert, as stellar as dessert was. A: it just wasn’t a good picture. if things had gone differently i think the egg dish would have easily been the main shot. T: Yeah, it’s cool that we had a good little dessert to fall back on for the photo, though. 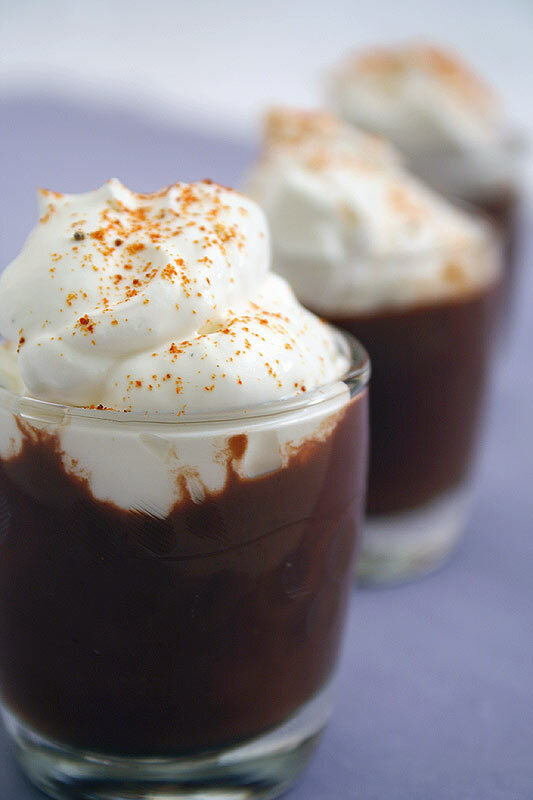 Speaking of that good little dessert, I gotta say, a spicy shot of melted chocolate with cayenne pepper is a lovely way to top off a meal! A: for sure! if anyone reading this has never had spicy chocolate you are missing out on one of the greats. chiles go better with chocolate than just about anything i can think of.. except curry powder maybe. T: Yeah, curry powder and chocolate.. mmmm. It’s amazing that there aren’t more interesting “mainstream” chocolates out there. It seems like you would be able to find a chocolate bar in 7-11 with some curry in it. Someday, maybe. A: when all things are right in the world. so it may not be anytime soon. you know i’ve even been searching the Whole Foods up here (and Trader Joes) and neither of those stores offers a spicy or curried chocolate… it’s just wrong. T: that is messed up. I thought that at least places like that would carry some spiced chocolate. A: not necessarily. that’s why people have to take the power back and make these wonderful treats for themselves. T: so true, so true. A: Well i guess i’m going to rate the overall food consumption this evening and mesh the dessert rating and the dinner rating. over all, even after the culinary failures, my belly was happy tonight. i give this evening’s meal a 4.1/10. The latke was particularly good, and the hollandaise sauce tasted yummy. I’m a fool for real whipped cream and thought the dessert was a nice touch tonight. T: I will give the items individual ratings and let the computer do the averaging. I give the meal a 4.7/5. It was so good… I could have eaten twice as much as I did. The hollandaise was incredibly tasty, and it all went absurdly well together. I give the chocolate dessert shot a 4.2/5. It was great, I loved the spice, but like we said with the strawberries a couple of nights ago, it’s just not high up on the dessert totem pole. A: true dat, i imagine we will have to do another dessert blog tomorrow, since laurie is coming down and we’re going to have to visit another dessert joint. Oh, I am going to make latkes and poached eggs this week, what a good idea. You should try it again and submit it to Kevin’s “Asparagus Aspirations”. And if you ever have trouble with egg-based sauces again, there are some tried and true fixes out there. I think Julia Child’s is best. Dare I ask what the phrase at the end means? Thanks for the great idea! I never know what to do with extra ganache or the stuff that never quite sets up properly. i love chocolate and chiles too. whole foods in plano texas carries the dagoba brand which makes a “xoclatl” bar with cocoa nibs and some type of chiles. incredible. dagoba also has chocolate with lavender, lime, all sorts of cool combinations. check with your whole foods about ordering some for you. btw, your blog is great. Thanks Dana! The whole foods in baton rouge carried all kinds of chocolates, my favorite being curry chocolate… but here in the big city of san diego, it’s a no go. what gives whole foods! get on your game! I am going to try this idea really soon!